Shortly after his arrival in Houston, Grimmett met Marshall Brucer who was the newly appointed head of the medical division of the Oak Ridge Institute for Nuclear Studies. Brucer immediately recognized that Grimmett could help him with his program at ORINS and invited Grimmett to visit him. 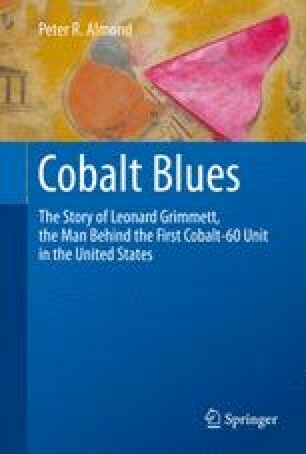 The visit was set for September 1949, and in August 1949, Grimmett revised the outline for the work of his department to include the use of cobalt-60 in radiotherapy by replacing the radium in one of his pneumatic radium units with 50 Ci of cobalt-60. When he got to Oak Ridge, he was promised 1,000 Ci and immediately recognized that the design of the machine had to change and immediately produced sketches for a new unit. He and Brucer agreed that a joint proposal between MDAH and ORINS was needed, and this would have to go to the AEC for approval. How this all finally worked out is described. It turned out that Oak Ridge National Laboratory could not deliver the 1,000 Ci of cobalt-60, and arrangement had to be made with the Canadian reactor at Chalk River to produce the cobalt causing further delay. The unit was constructed by GE and was ready in early 1951 and was shipped to ORINS for testing with a borrowed 200 Ci source. Grimmett was to go to ORINS in August 1951, but, he died suddenly on May 28, 1951. By September 1953, the new building for the MDAH was ready to receive the unit, and it was shipped to Houston. Patient treatments started in February 1954. It was used until 1963.